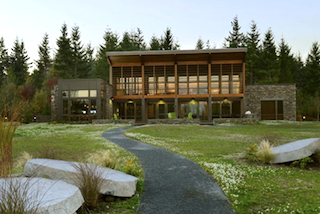 Trilogy at Tehaleh offers breathtaking natural surroundings and impressive views of Mt. Rainier. Just northwest of Mt. Rainier National Park in the Tacoma area of Washington, is the Shea Homes community of Trilogy at Tehaleh. Tucked away from the hustle and bustle of city life, this 55+ community is conveniently located near Seattle yet surrounded by scenic forest preserves and views of the majestic mountain peak. Trilogy at Tehaleh is a 55+ community planned for 500 homes within the 4,200-acre master-planned community of Tehaleh. The scenic location on elevated forest land creates an intimate setting that feels worlds apart from the nearby cities of Seattle and Tacoma. Created specifically with Baby Boomers in mind, Trilogy at Tehaleh strives to bring residents a nourishing atmosphere to support the mind and body. Amenities revolve around maintaining social connections and encouraging new friendships. Residents here find inspiration to focus on wellness, exploration and learning. The Post is Trilogy at Tehaleh's neighborhood clubhouse. Its architecture blends seamlessly with the surrounding environment, and an outdoor area for eating and relaxing lets residents enjoy the views. 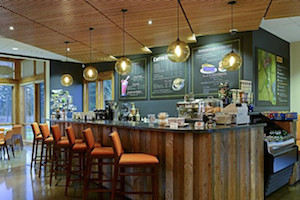 Inside, a bar-style café and plenty of social spaces provide room to kick back with friends. It's a great place to meet up before heading out for a day of fun. Active adult residents enjoy world-class amenities, on-site dining and exciting social events. The natural scenic surroundings of this unique 55+ community are impressive and majestic with the homes designed to seamlessly blend into the landscape. Shea Homes offers a nice selection of new construction floor plans available in a range of sizes from 1,426 square feet for a cozy, one-bedroom home to 2,261 square feet for a spacious, two-bedroom home with an open floor plan and two-car garage. Choose from one or two-story designs all featuring beautifully appointed kitchens and high-end features both inside and out. In addition, homes are built to support SheaXero No-Electric Bill living. While the local area has plenty of traditional recreation, the big draw at Tehaleh is nature. There are more than 1,000 acres of open space and parks, with biking, backpacking and bird-watching right in your back yard. A well-developed trail system spans 7.5 miles worth within the community and connects to 300 additional miles in the Mt. Rainier trail system. Trilogy at Tehaleh is located just south of the city of Bonney Lake. It's 20 miles southeast of Tacoma and 39 miles southeast of downtown Seattle, close to Interstate 5 and State Road 410 which leads into Mt. Rainier National Park. With stunning views, elegant homes and exciting amenities it's easy to see why Trilogy at Tehaleh is such a popular destination for active adult living in Washington.